Haneda Tokyo International Air Terminal | G'Day Japan! Tokyo’s very own airport, connecting Aussies to 48 destinations in Japan! 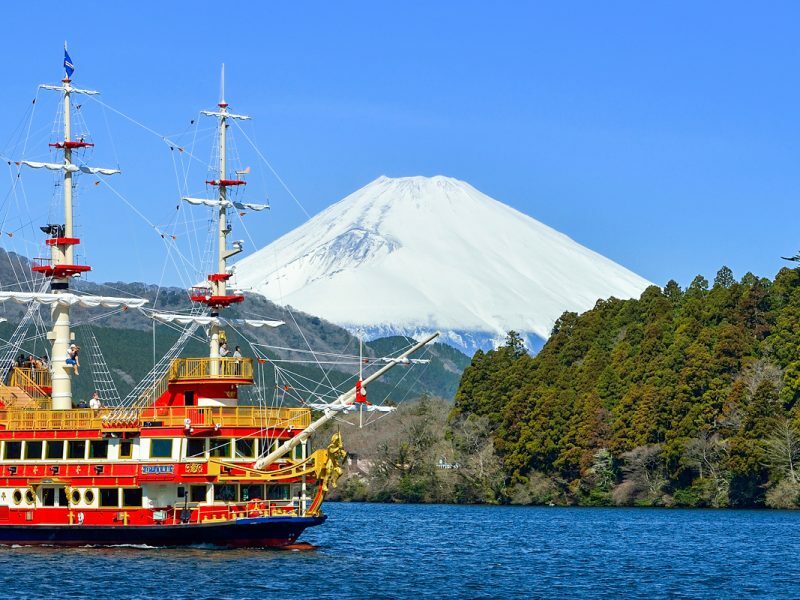 Australians are starting to catch on to a better way of travelling to and further into Japan. They are discovering Tokyo International Airport, also known as Haneda Airport; the address of which is – unlike Narita – actually in Tokyo city. This airport is known for its convenient location as well as for its modern design and exciting features likened to theme parks by some. 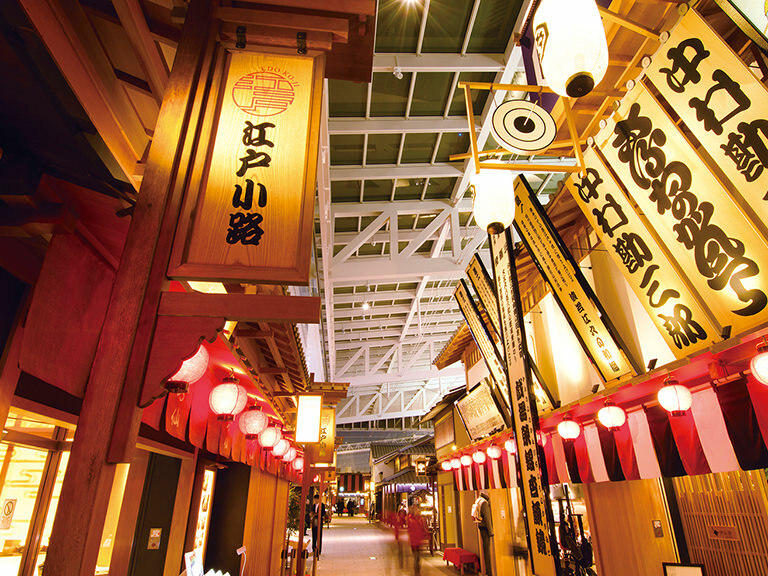 There are many benefits to choosing Haneda as your point of entry and exit to Japan. 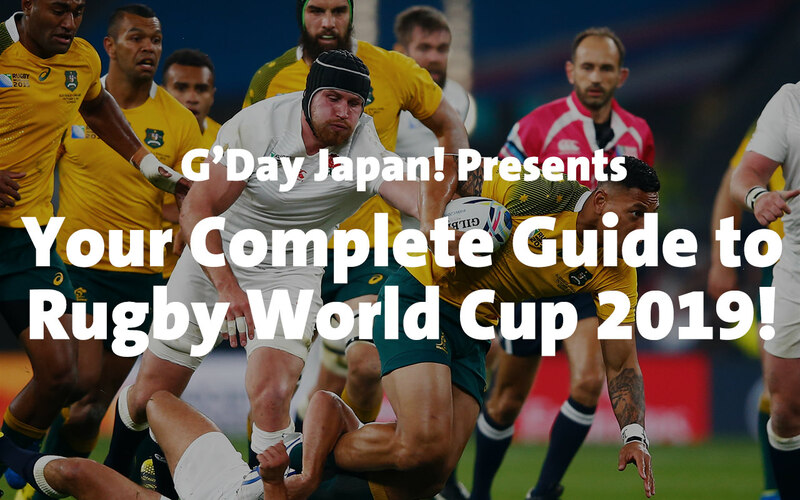 First and foremost, Haneda is super easy to access to and from Tokyo and the Kanto region. From Australia, Qantas and ANA (All Nippon Airways) have direct flights to Haneda. 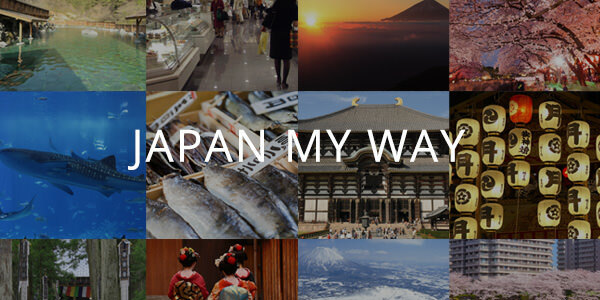 Once arrived, you have several options to travel out into Tokyo. You have the option of taking the Keikyu Line to Shinagawa then change there to connect to places like Shinjuku and Shibuya, which will take between 30 – 45 minutes. From Shinagawa, you can also get the bullet train or limited express trains out to popular areas like Nagano, Hakone or all the way to Kyoto! There’s also a Monorail to Hamamatsucho, where you can swap to the famous Yamanote Line to access popular locations like Tokyo, Akihabara and Ueno. 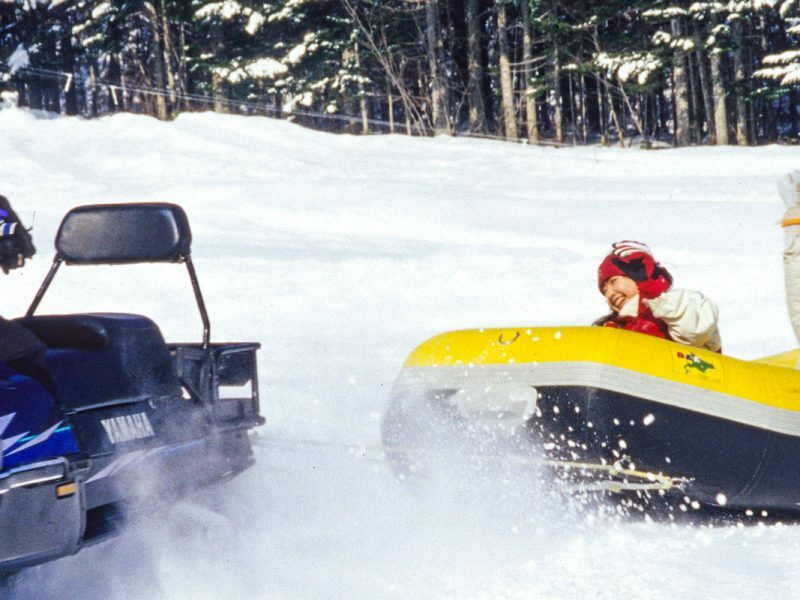 For those with large luggage, there are plenty of airport transfer as well as late night buses to most city areas in Tokyo and to Yokohama, as well as to the greater Tokyo area and even Tokyo Disney Resort! For those flying into Haneda, this means that within 30 – 45 minutes, you can get to the most exciting parts of Tokyo. So, you can begin eating your way into Tokyo or shop till you drop within the first few hours of arrival. 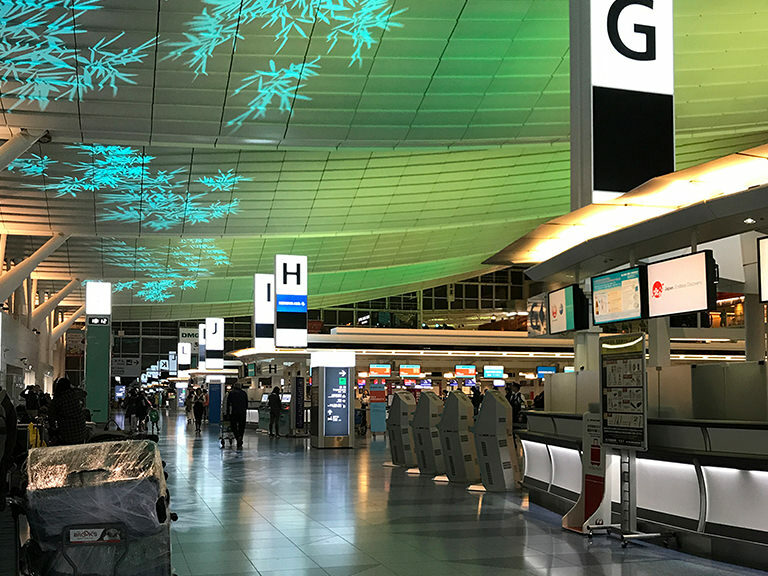 Another point of convenience that Haneda provides for travelers is the fact that you can fly to 48 destinations around Japan from its domestic terminal. 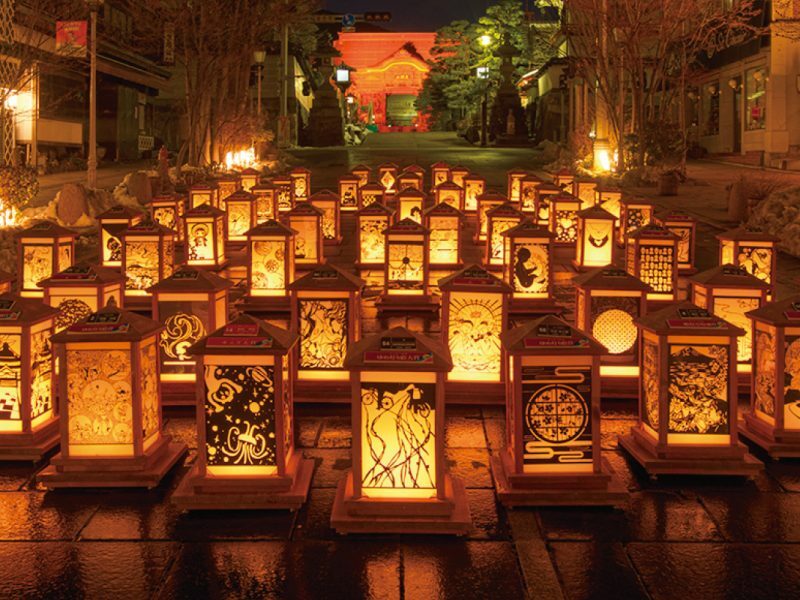 The Visit Japan program ran by ANA and Japan Airline flights will take you to Japan’s most exciting holiday destinations such as Hokkaido, Kyushu and Okinawa from Haneda. 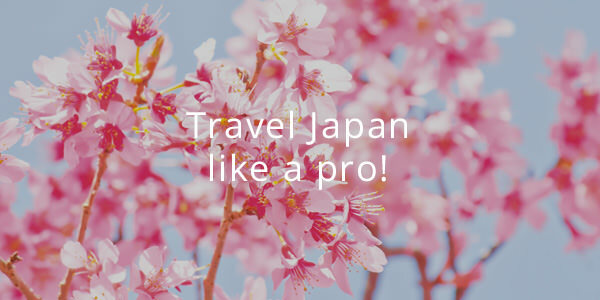 Whether you transfer to domestic straight up from your flight in from Australia to the domestic or you come back after you spend some time in Tokyo first, with Haneda being just a hop, skip and jump from the city, discovering other areas of Japan is very easy. 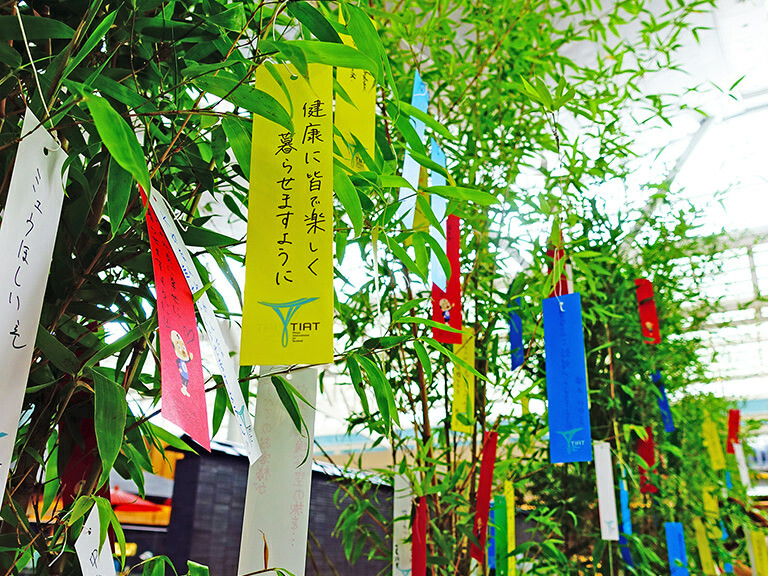 If you do use the domestic terminal, be sure to visit their in-house shrine, the Haneda Koku Shrine in Terminal 1 to wish for good luck during your travels. When it comes to departure, again, it’s an easy train ride back to Haneda from Tokyo – but we suggest you get there with a little more time to burn at the airport. Why? 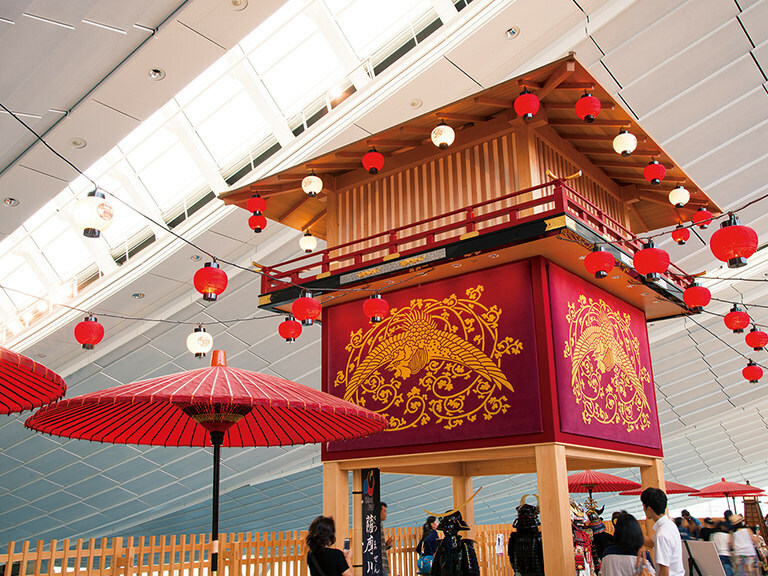 Because Haneda airport isn’t just an airport – it’s also a cultural entertainment hub! It’s a place where people who aren’t even flying out come to enjoy its fabulous facilities – you can expect great food, shopping and entertainment there. 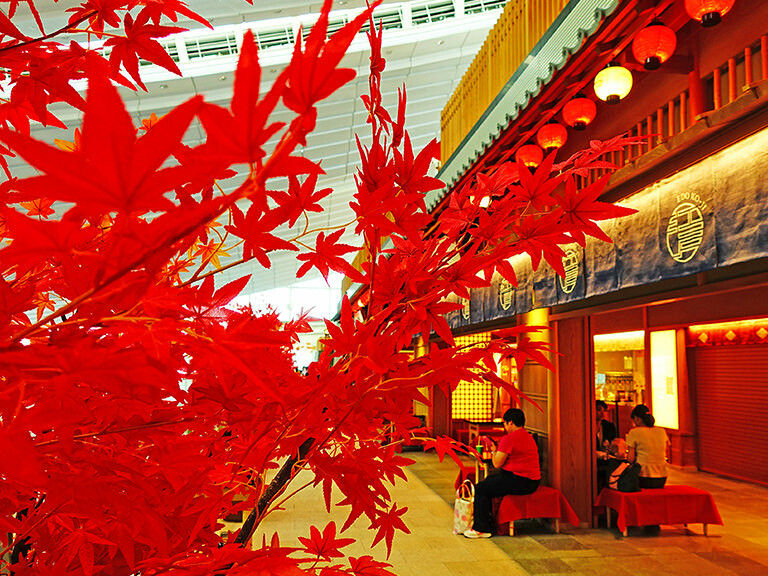 The main point of attraction at Haneda is the area known as Edo Ko-ji, located on the 4th floor. Edo Ko-ji was designed in the style of the Edo period, recreating the bustling streets filled with unique merchants of the time. It is a completely different vibe to the rest of the airport with mostly timber fixtures and lanterns lining up and down the stretch of its main ‘street’. 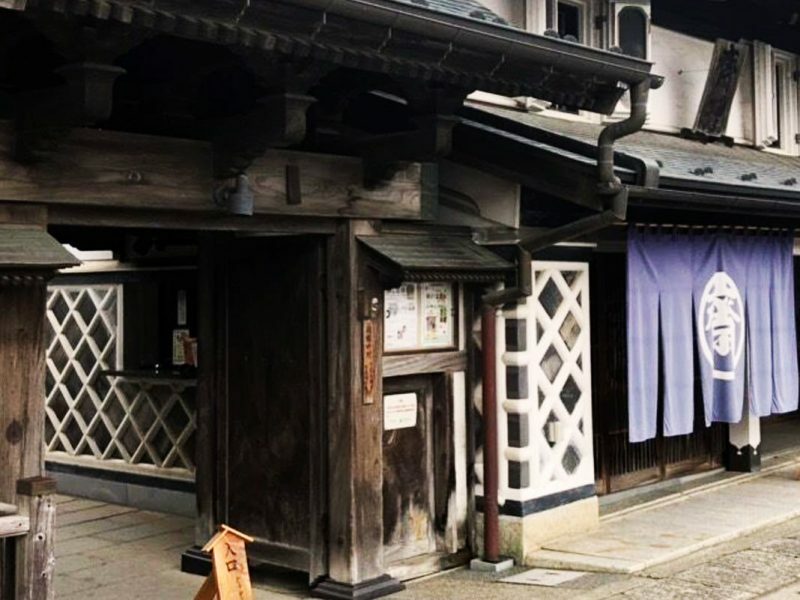 If you have some last minute souvenir shopping to do, Edo Ko-ji has all sorts of traditional Japanese items that would truly impress the receiver. Beautifully designed, Japan themed items like phone cases, tote bags and T-shirts are also available at the stores here too. 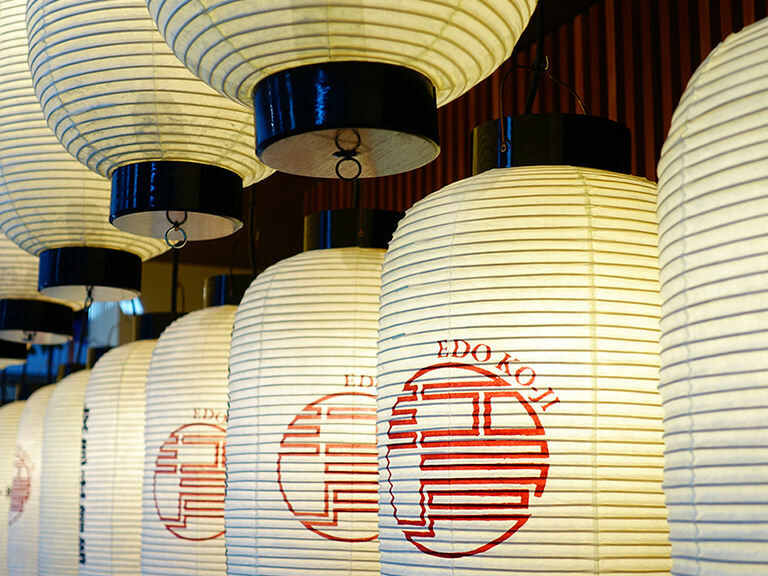 There is some fantastic dining available in Edo Ko-ji as well and there are plenty of options to choose from. There’s sushi, tei-shoku (Japanese set menu) meals, ramen, yaki-niku (Japanese BBQ), yakitori… Basically any sort of Japanese food you can imagine, you’ll find here. Many of the restaurants are vegetarian and Halal friendly (with more options on the third floor as well) – so you can rest assured that there’s something for everyone in your group or family! If you are taken by the current Matcha (green tea) trend, there’s also an open cafe at Edo Ko-ji, by tea brand Itoen, where you can enjoy a lovely cup of Matcha and some sweets made with Matcha. 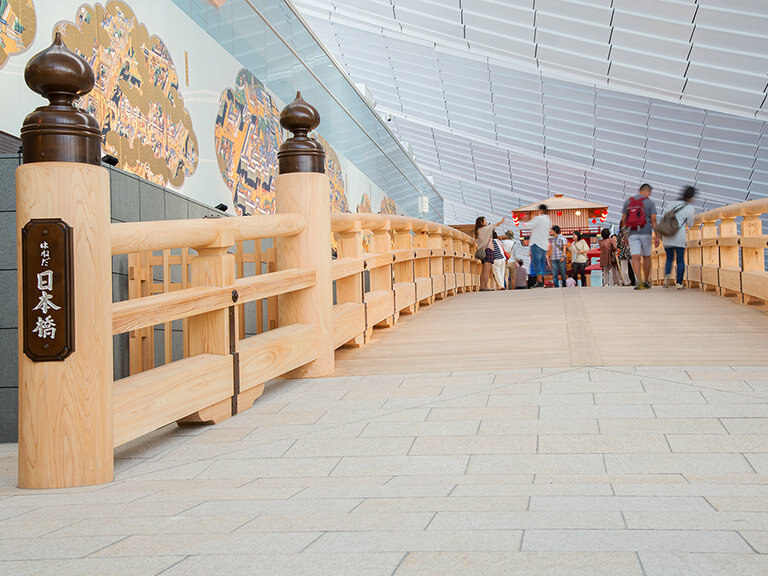 For one final photo op, you can head over to the half size replica of Nihonbashi (an iconic bridge that was built in the Edo period) which was a bridge built in modern day Tokyo, that inspired its people to travel. 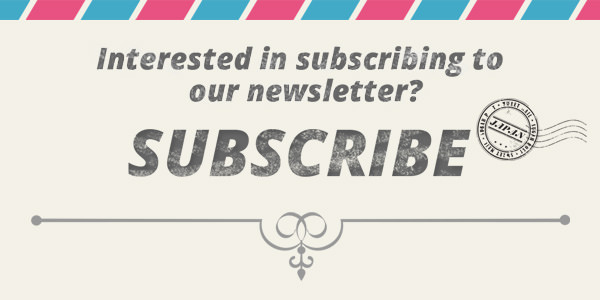 Or if you’re lucky, you may get to catch seasonal performances and events to showcase traditional arts on the special stage. 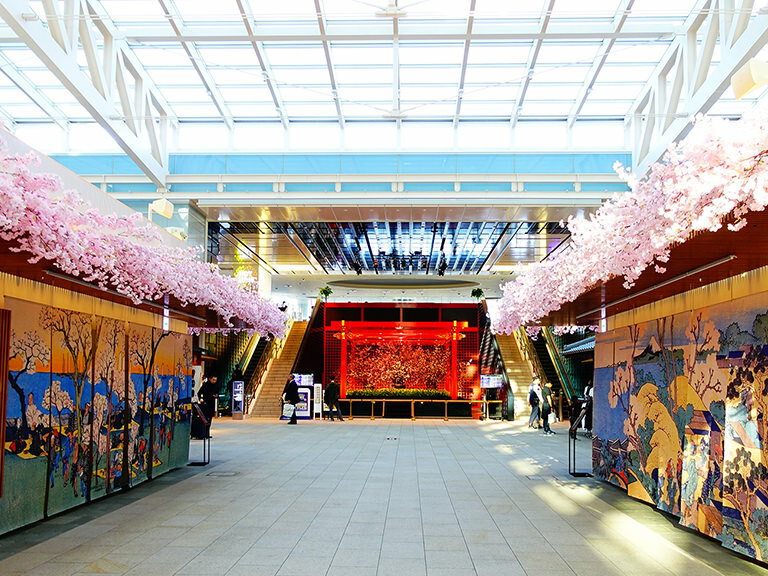 Up on the fifth level, you’ll get to enjoy Japanese pop culture at the Tokyo Pop Town area. This brightly coloured area is where you can grab some adorable Hello Kitty goods and quirky Japanese items. There’s even a small version of the popular variety store chain, Don Quijote here, called Soradonki. 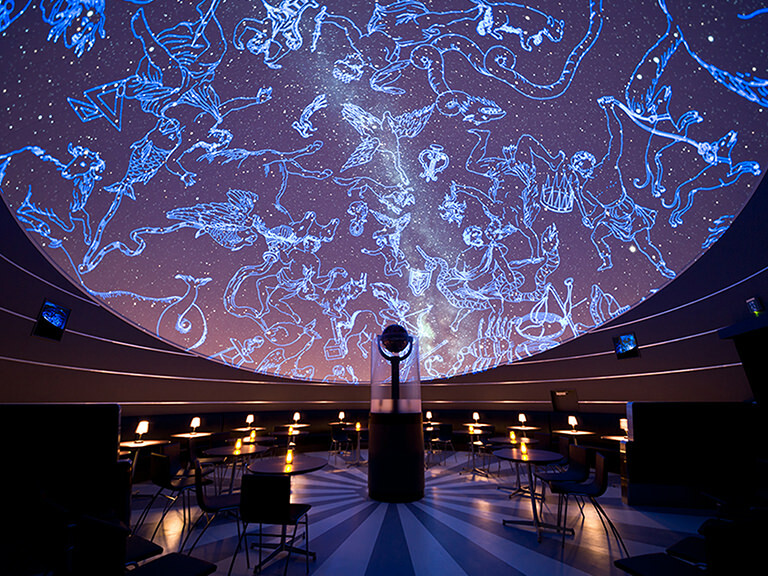 Truly sticking to the quirky kawaii theme on this floor, there’s a cafe that also doubles as a planetarium where you can enjoy food and drinks while you look up to the different projections of the sky above including constellations. 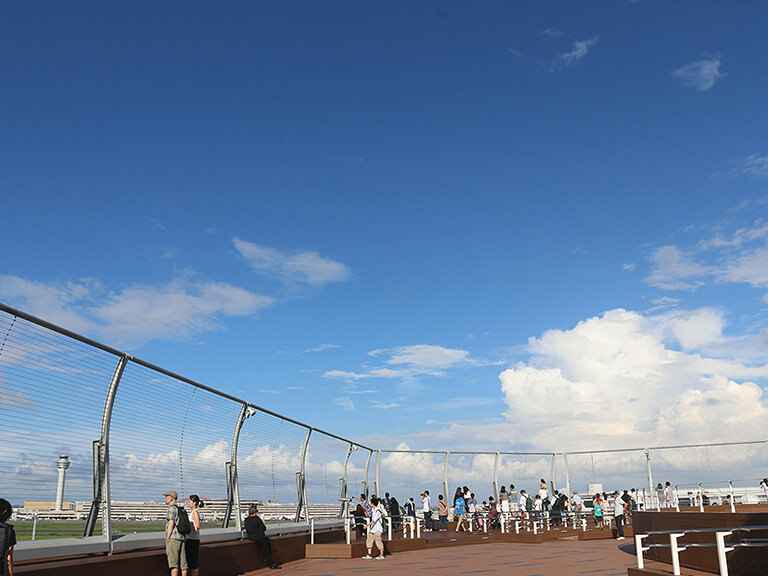 The outside area of the 5th floor is the observation deck, where you can watch jumbo jets set off into the sky which is a thrilling sight to see, especially for the little ones! Also on this floor are four sets of flight simulation game which will let you fly to and land to airports from all around the world. You can choose your machine depending on your level, from beginner to advanced. Of the four, one machine features a chair and remote controls that move and shake like the real thing. So that’s another way to stay entertained while you wait for your flight. The rave reviews about Haneda and its facilities does not stop after you go through immigration. Being an international airport, you’ll of course find products from some of the best brands in fashion, cosmetics, technology and alcohol available duty free. 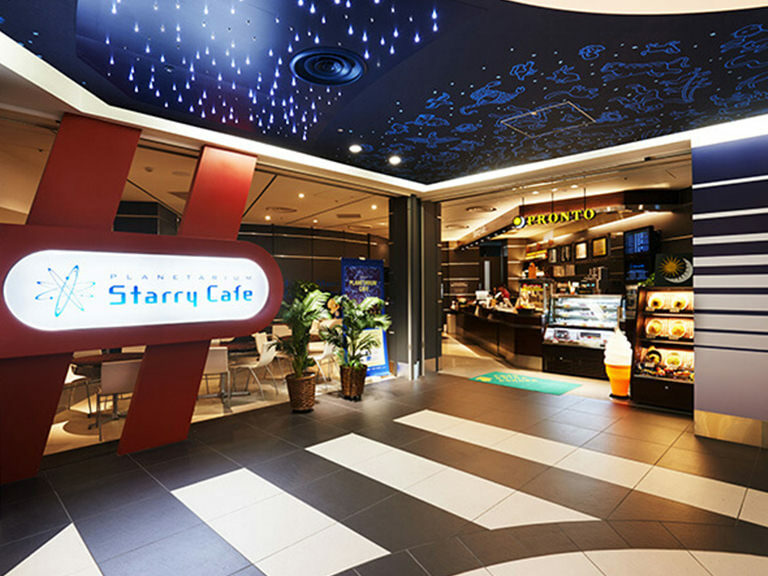 There are also fantastic free facilities like comfortable charging lounge chairs with USB ports to charge your devices, kid friendly play areas. If your boarding gate is a bit of a trek, feel free to hop aboard one of the carts to be driven to your gate. 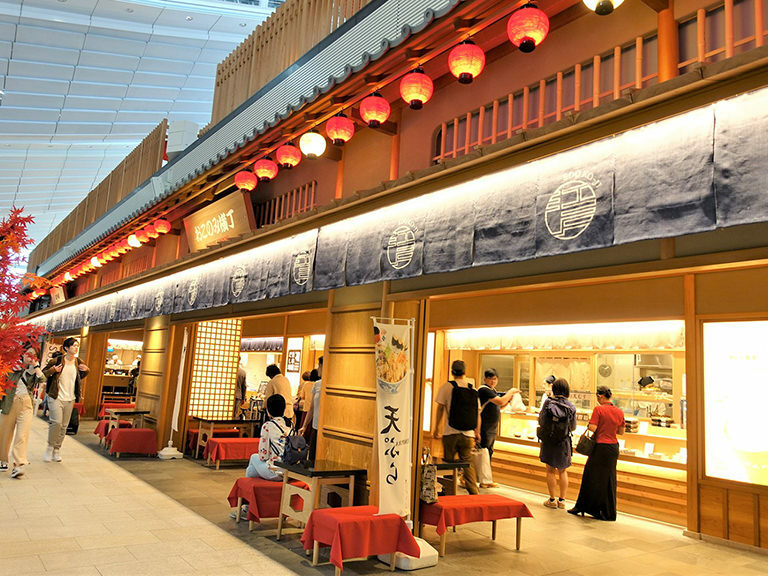 Haneda is also known as one of the cleanest airports in Japan, so you’ll be feeling nice and fresh. If you missed out on the many dining options before you came through immigration, there are some tasty food vendors at the food court. There’s even a ramen shop that sees lines of people at its store in Tokyo, so that’s a must-try before you fly. 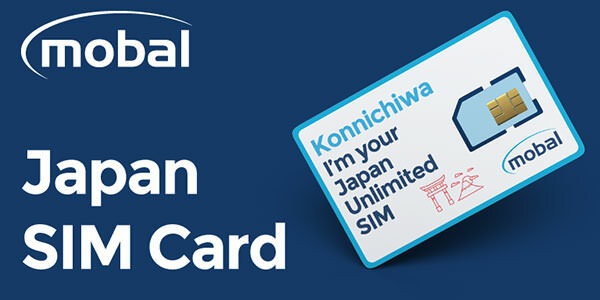 Stay up to date with all the latest on Haneda Airport by connecting with them on Facebook and Instagram! The Instagram is filled with photos of the gorgeous seasonal decorations at the airport as well as photos of food and products that are available there. 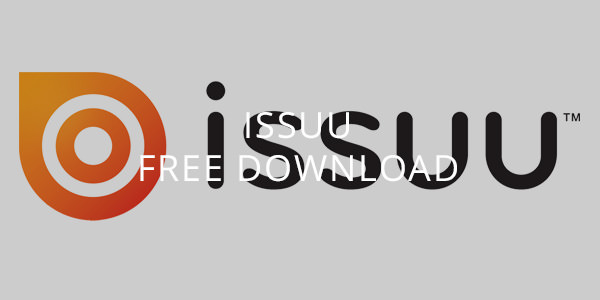 For those with smart phones, head to the Hello! 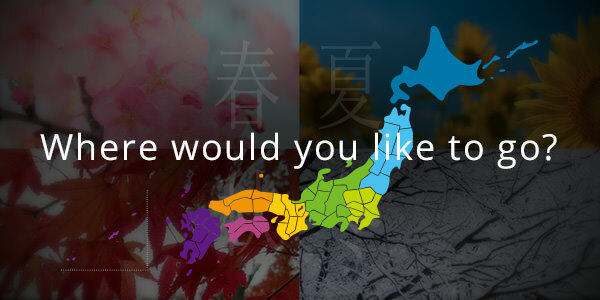 Haneda-Tokyo website to get an idea of where you can travel to from Haneda. 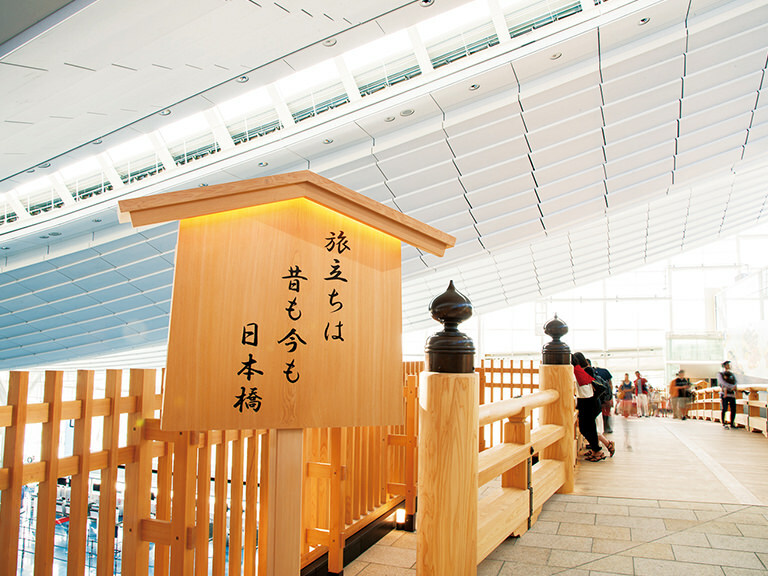 This includes a list of the 48 destinations accessible from Haneda as well as what unique offerings those locations provide. There are further information on all the fabulous facilities and events at the airport available on this website too. 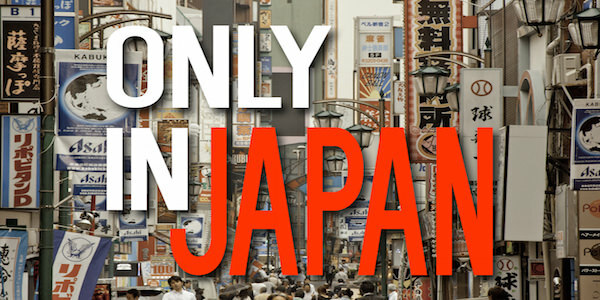 It’s certainly worth checking out when preparing your holiday to Japan!